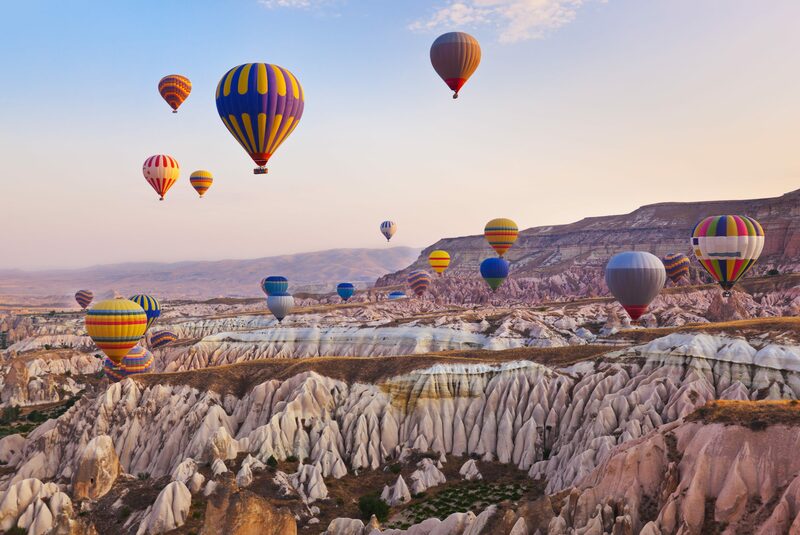 Ah, to take to the skies in a hot air balloon. Or to be more precise, to fly 3000 feet over rocky terrain in what is essentially a wicker basket with no lid. Me overlooking the beautiful Love Valley, with the Rose Valley in the distance, from the safe vantage point of solid earth. Photo credit: Hijabimeetsworld. Not being afraid of heights, I was eager to cross this off my bucket list. My travel companions for this adventure were SH (my sister and the Marco Polo of the family) and SHJ (a two year old with more stamps in her passport than the average adult). We were picked up from the hotel at 5 am where we were driven to the Balloon Company’s base camp. There, we soon felt more human and less zombie after some coffee and a light breakfast. Over sixty other thrill seekers joined us from all over the world. The air was thick with conversation and anticipation. Each passenger was given a ticket with the name of their pilot. Several buses pulled up outside and we all were ushered into our respective minibuses, around sixteen passengers apiece. I’m sure the drive was scenic but since the sun had yet to rise, my view consisted of dark blue sky and a handful of stars. We were driven about 20 minutes into the barren Cappadocian terrain and by the time we arrived, night was beginning to turn into dawn. I hopped out of the minibus into the cool morning air to get a closer look at what we would be flying in. I watched as our balloon, with shades of fire blasting into the billowing fabric, was prepared. My nerves began crawling to the surface. Was it too late to back out now? Was I seriously about to float off into the sky in little more than a basket and balloon filled with hot air? Seeing me panic, SH took the opportunity to point out it wasn’t the only thing filled with hot air and I quickly regretted boasting of my indifference to heights. Seeing as SH Junior was too small to fly, SH and I had initially intended to split the experience over two days so that one of us could stay with SHJ. At this point I was quite happy for this to be me (great excuse to stay grounded! ), but one of the organisers piped up that she would babysit SHJ so that we could fly together. Armed with a carton of juice and an episode of Paw Patrol, we waved adieu to SHJ- who showed very little concern that we were about to fly away – and with us much dignity as I could muster, I hitched up my abaya and fell climbed into the basket. Our pilot was called Turgut (fans of the hit Turkish drama Ertugrul, rejoice! ), and he gave off an air of confidence that helped me feel a little less anxious. “When landing, hold onto the rungs and bend your knees in anticipation of the impact. And please, do not lean over the basket for your selfie!” With that, we rose up, up, up into the air. The balloon ascended faster than I thought it would, racing the sun up into the sky. Pink jagged rock formations soared below us as we floated through the Rose Valley. 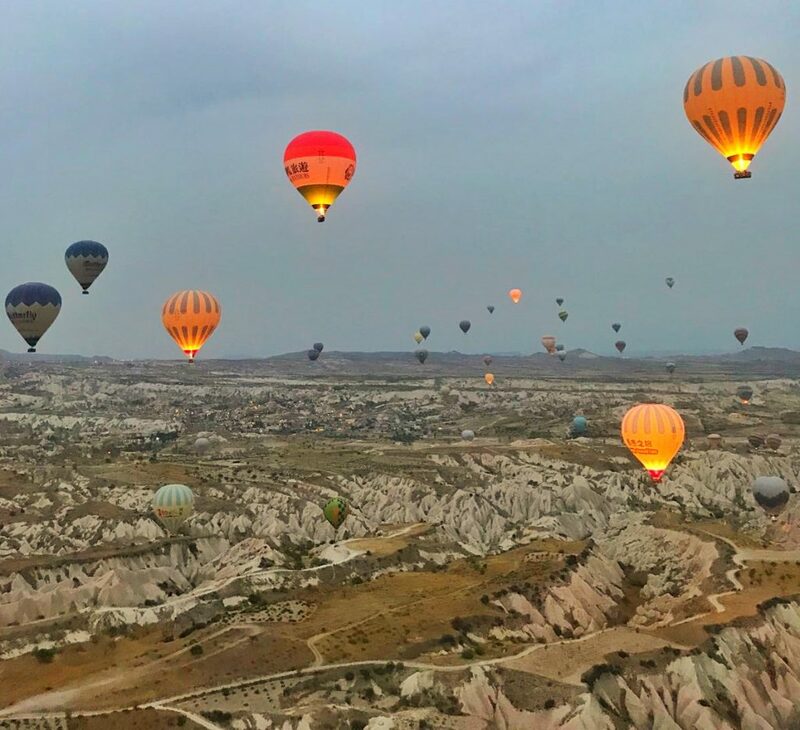 A hundred other hot air balloons in a rainbow of colours joined us and we filled the rocky horizon like floating baubles. Turgut was said to be one of the best pilots around and demonstrated this with his daredevil moves and last minute manoeuvres. At one point he flew us dangerously close to the rocky precipice. Just when we were about to hit, he pulled hard on a rope which pulled our basket swiftly over the top of the very sharp rock formation. Apparently this was all part of the show though, as he did so with a big grin on his face as he watched our expressions transform from horror to relief. By this point the sun had started to crest on the horizon, basking us with its beautiful orange glow. With more light now, our gaze extended further over the horizon. 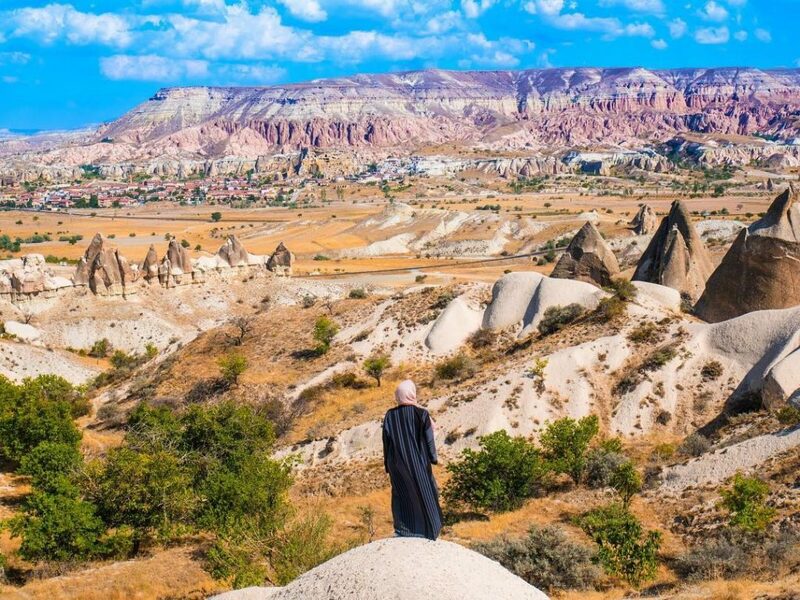 The famously dubbed Love Valley came into view where huge rock formations loom over the landscape. SH and I took the opportunity to take as many pictures as we could. What was most astonishing to me was to observe just how quickly dawn passes into day. Blink and you could miss it! The whole experience lasted about 45 minutes. Turgut managed to navigate the basket to land directly onto the trailer that would take it home. Our safe landing was celebrated and the organisers welcomed us back down to earth with cake and non-alcoholic champagne, set out beautifully by the hot air balloon team. 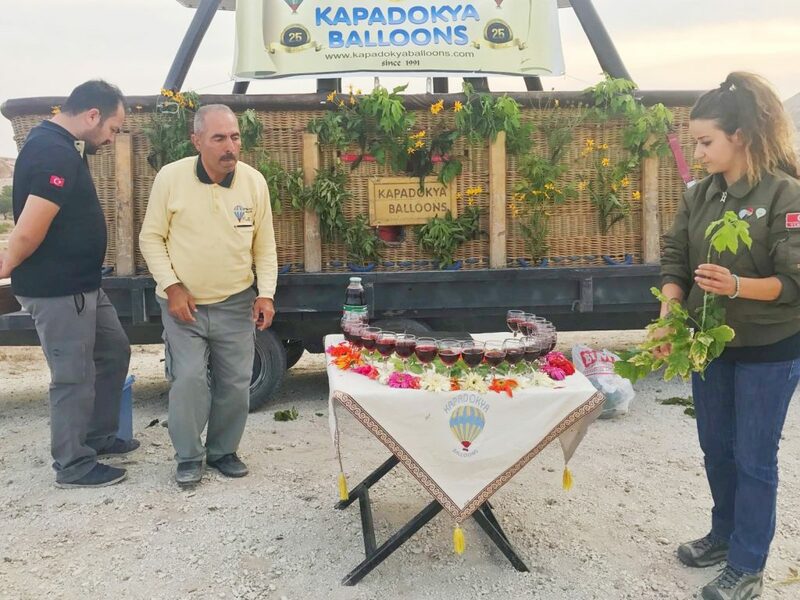 The hospitality and friendliness of all the staff really made it extra special and I would highly recommend using Kapadokya Balloons for an unforgettable experience. 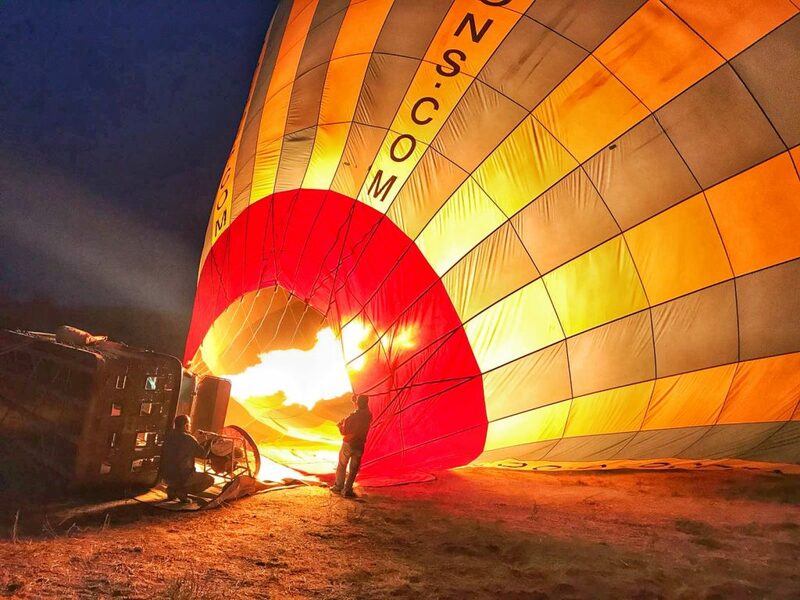 Do not book your hot air balloon ride online. The best way to book is to ask at your hotel whether they can secure you a special price, as they usually have good relationships with the balloon operators. 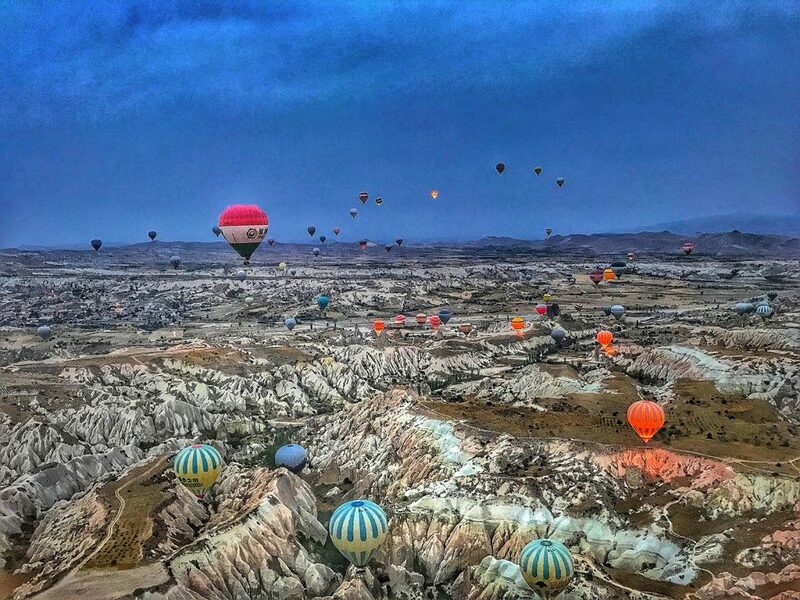 The price of flying in a hot air balloon in Cappadocia can vary depending on the tourist season. At high season the flights can get booked up very quickly, and the high demand can push prices up by an increase of 60 euros or more (to upwards of 150 euros). However, some flights can go for as low as 85 euros. If you follow step 1 you are more likely to get a good deal. Wrap up warm – even on a baking hot day, it can get pretty cold once you are up in the air. Check with your chosen balloon flight operator whether they offer champagne or non-alcoholic champagne as part of the post-flight celebration. Try to avoid wearing floor-length clothes, or even sandals – you will need to climb into the basket, and it is difficult enough without tripping on a dress or having your foot slip. Young children are not allowed to fly. Check with your balloon operator, but usually they need to be at least the height of the basket. On the plus side, the Turks are generally wonderful with children, and will do whatever they can to accommodate the needs of a young family. If you are travelling during the Turkish winter, be mindful of the fact that flights will be cancelled if the weather is windy or generally too dangerous for flying. 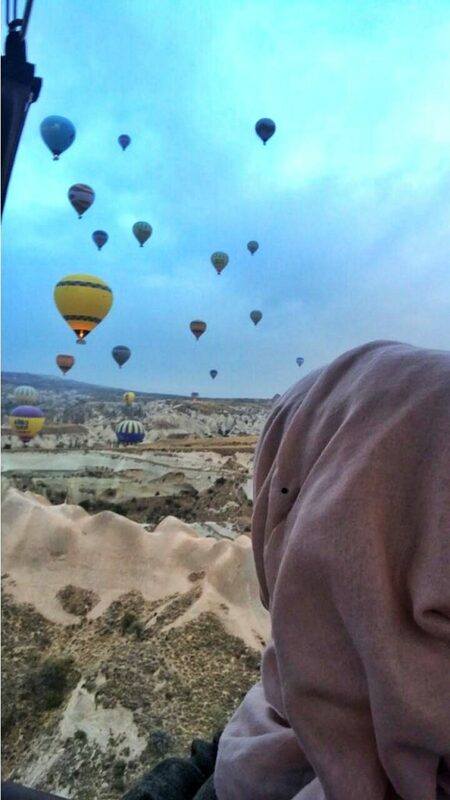 Find out more about what Maryam discovered when she visited Istanbul.